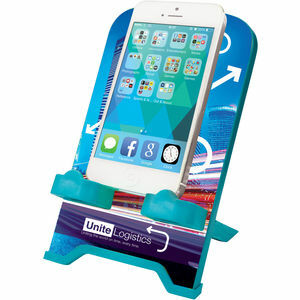 Our Brite-Dock is a brilliant way to get your brand in front of your customer all day. This handy stand will hold a variety of mobile devices, smart phones and e-readers. Made in the UK, the Brite-Dock is available in a wide range of colour options (Black and white are standard colours. MOQ of 250 for colours) and offers stunning colour reproduction for your logo and design. The large branding area is perfect for carrying all your contact details, product information, calendars or simply bold images or slogans. The Brite-Dock has easily removable feet and is supplied flatpacked in an individual gift box - perfect for mailings.